It's official - The people LOVE "Sock n Boots"
Over the past few months the Sock n Boots team has reached out to parents and children from all over the world and the response has been the same, THEY ALL LOVE IT! The guys will make their way to Beijing at the end of the month to try and get more publicity. Our hope is that an agent and/or publishing company will help us get the guys in front of the masses. So far everyone that has read the book loves the story and the characters. You can read more reviews at www.socknboots.com. If you are an agent or a publisher looking for the next children's book stars, the sock n boots team wants to hear from you. In search of 1 MILLION reviews. After many successful reviews of his new book “Sock n Boots-Share,” author D.K. Smith has set out to get the opinion of even more readers, 1,000,000 readers to be exact. That’s right MILLION! Readers from all over the world can download a watermarked version of Smith’s book from now until August 20, 2010. Then by posting a review of the book on Amazon.com they can enter to win 1 of 5 giveaway copies of the book. You can read the reviews that have already been posted on Amazon.com or you can go to www.SocknBoots.com to read other reviews. For more information contact the Sock n Boots staff at SocknBoots@live.com. It appears that Sock and his best friend Boots are making quite an impression on moms everywhere. 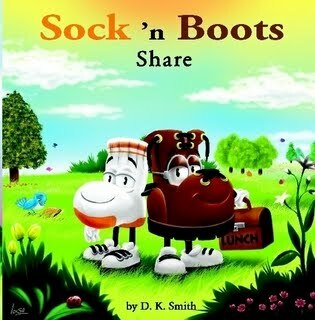 Recently, children's book reviewer Ellen Christian chimed in on Sock n Boots-Share. 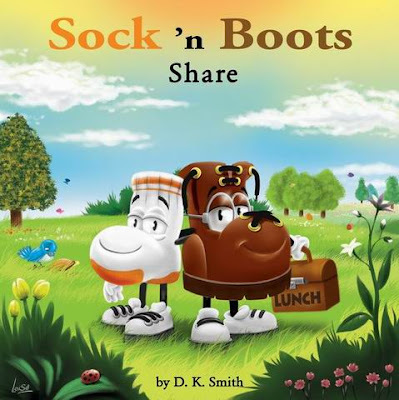 Sock 'n Boots Share is an adorable children's book that teaches children about sharing. The book begins with the question about why we should share. The story then explores that question by following the antics of Sock and Boots as they go off to play and have lunch in the park. By following along, your child will learn why sharing is so important. I really love Sock 'n Boots. They're adorable and funny and will certainly engage your child in reading this fun picture book. The pictures are bright and colorful and make the book visually appealing to your child. Sock 'n Boots Share is one of a series of books offered by D. K. Smith that will teach children different life lessons. It encourages sharing between parent and child by asking the child what they have learned. Other books in this series include Sock 'n Boots Play it Safe and Sock 'n Boots Afraid of the Dark. My thanks to the publicist for allowing me to review this book.As required by the FTC: I received a product sample in order to write my review. I received no monetary compensation. All opinions expressed are mine and mine alone. I always like to read Audrey's books before I read them to her (really I like playing with all her things, because, well it's just plain fun!). I loved this book! I thought the story, and the characters were so adorable, and I couldn't wait to share it with Audrey! Sure enough she loves it too! So much that it's her first pick before bed (and I have to read it over, and over again)! And as a mother I love that each book teaches a lesson, and that it's not too long. Also that it's colorful, and rhymes, which easily catches her attention! Sock 'n Boots Share follows two best friends (the loveable and emotional little Sock and his pal the wise young Boot) as they set out for a day of fun at the park. When a flock of hungry birds flies in, the stage is set for a lesson on why sharing is such a good thing to do. The fun rhyming scheme and simple storytelling style make the book enjoyable and easy to follow. The short story format and simple storytelling style of the Sock 'n Boots series makes it easy to teach age old yet valuable lessons to their children. The pictures along with the story spark an imaginative thought from children that read the book, especially when parents engage them in a discussion about the book. This book was sent to me for review by the author, and it was a pleasure to look it over.It's a picture book for young children that has charming characters. It would appeal to those in the 1-4 age group.The book begins with a question, tells the story with a lesson about life, and ends with a question that leads into a discussion of what they just read and what it meant. It will also reinforce the lesson.In this story, Sock's lunch gets eaten by birds, so they "share". The characters are cute, the message is important, and I'm sure you'll get some very interesting discussion in groups.This book would be good for a daycare center or anyplace that children gather. You can buy a copy at Lulu.com. Visit the author's website at www.socknboots.com for info about additional books that will be published in this series. The next one scheduled talks about being scared of the dark - and that was one of my biggest frights as child. I'm looking forward to reading that one, too! "Good reads", the largest social network for readers in the world (with more than 3,400,000 members ) is hosting an online giveaway of the the first book in the Sock n Boots series. Become a member at www.Goodreads.com to enter!